I hear it was nice and warm while I was away in a nice and warm place, which makes me kind of sad to be met with icy wind and snow, but that's how it goes. It's back to reality and back to winter so I'm seeking out warm and cozy options to keep bundled up in until I readjust. I've had my eye on this J. Crew coat since spotting it in the store back in December. I love the relaxed shape and that the fur trim is removable, a huge plus for those wet days. I'd pair it with suede leggings, a comfortable sweater, and snow boots. More on our trip to come. Love love love that jacket! And those suede leggings are a must! Gorgeous! Ooo that coat is gorgeous!! I can imagine how much of a pain it is transitioning to a snowy NY right now. I bet it's so dreamy, though! LOVE the coat and bag! Stay warm...its in the negatives in Chicago! I am so in love qith this outfit! I want each of these pieces and to be wearing this outfit right now!! So cozy and perfect! 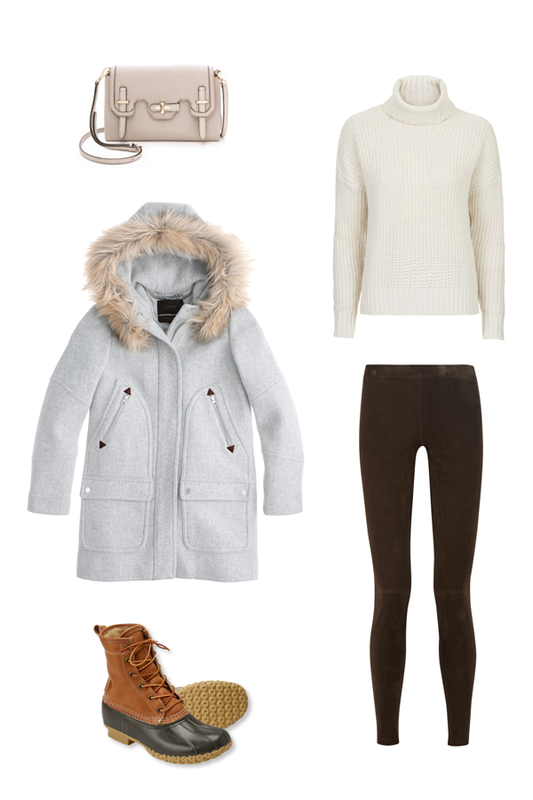 I am obsessed with that coat, it looks perfect for these freezing days! That bag is everything, I am beyond obsessed its absolutely chic!! What a freaking amazing video. Love the action shots. I feel so weird recording myself. That bag is so gorgeous! also the title of your post reminded me of TSwifts song which I love! So glad we connected on instagram (jjharding0)! that coat seems like it'd keep you warm, and it's chic! Sadly I'm not so great with final cut. My very talented cousin made the video. What a great jacket! Love it!